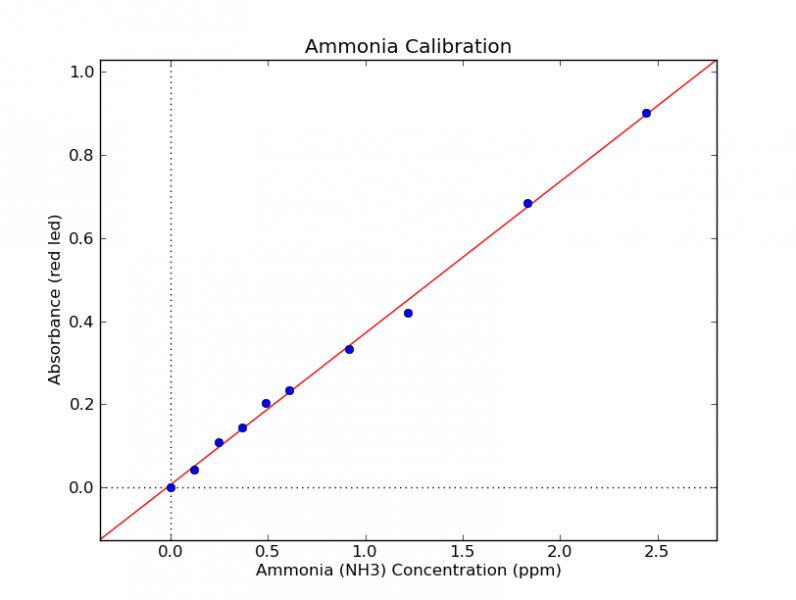 Measuring ammonia levels with the colorimeter | IO Rodeo Inc.
A 1000 ppm solution of ammonia standard was purchased from Grainger (Cat # LC17940-1). 1 mL = 1 mg N (1000 ppm N) = 1.22 mg NH3 (1220 ppm NH3). An aliquot was diluted with distilled water (dH2O) to a working stock of 10 ppm (1 mL in 100 mL) and 100 ppm (10 mL in 100 mL dH2O). These were diluted with dH2O futher to get the a range of ammonia levels up to 2.0 ppm N (2.44 ppm NH3). 5 mL of each solution was transferred to a test tube and ammonia levels tested with the API freshwater ammonia test kit. The image below shows some of the solutions after approx. 5 mins when full color was developed. A control sample (dH2O) was developed alongside the ammonia samples and this was used to calibrate the colorimeter. Absorbance of the resulting green color was measured with the red led and results plotted. Tube 0 = dH20; 1 = 0.1ppm; 2 = 0.2 ppm, 3 = 0.3 ppm; 4 = 0.4 ppm; 5 = 0.5 ppm; 6 = 1.0 ppm; 7 = 2.0 ppm.